There's one thing about GTD apps I'm uncomfortable with: badges. They're such a necessary evil. There are tasks that can only be done in specific moments of the day, so it doesn't help when the app displays a task to be done at noon that can only be done after I get back home. 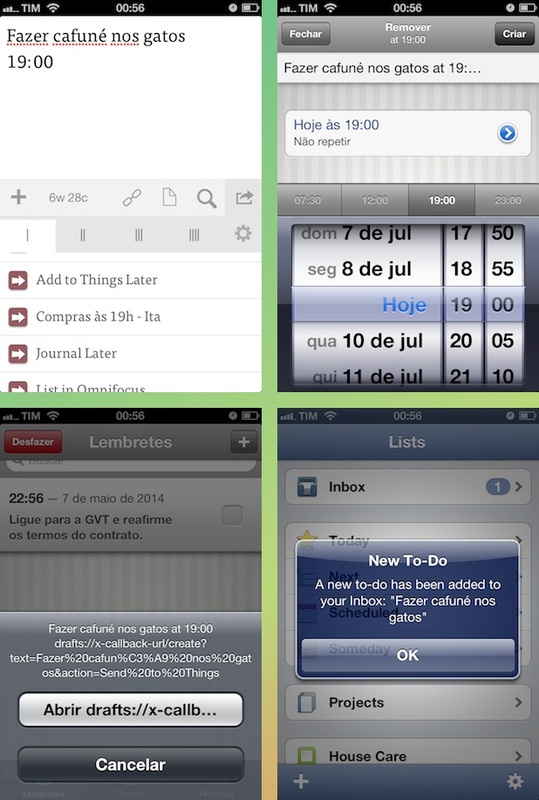 If you rely on your GTD app, then these tasks waste the scarce space of your phone screen. We're going to fix it today. I chose this rule to start because it is the most different among all the next examples. Since Things' scheme doesn't begin with ://, Due doesn't identify it as link., so to make it actually work, I make a detour at Drafts, where it activates the default rule Send to Things. If you miss that rule, pick it here. Just in case you're lost in life, you can grab a rule for Firetask1 or The Hit List. As the previous cases, the first line makes the task and the second line specifies the time for Due to define the reminder. Perhaps you're a minimalist folk, or just a hipster, and prefers to use Clear or Ita, which brings you the possibility to select a list2 to add your task when the time comes. We can accomplish that easily with the new [[line]] tags from Drafts. In both actions, first line corresponds to the name of the list, while the second names the task and the third points the time for Due. With only a few modifications, any of the actions described here may contain an additional line to include more informations or you may cut a line if you use a specific time often, as my after work duties after 7 pm. By the way, I've only testes this rule at Things, Clear and Ita, so if something goes around, leave me a message at App.net or Twitter.